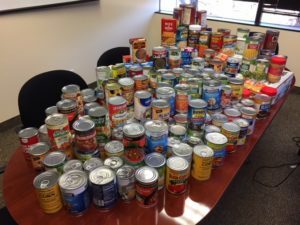 Northbrook, IL – From November 12th to November 16th, Prime Publishing hosted its second annual Thanksgiving Food Drive. The company-wide food drive, in which employees were encouraged to bring non-perishable food items into the office or donate money online, was hosted in partnership with the Greater Chicago Food Depository, a food bank which provides nourishment to the people of Cook County, IL. With Thanksgiving occurring the following week, it was an appropriate time to give back to the local community and help those less fortunate. 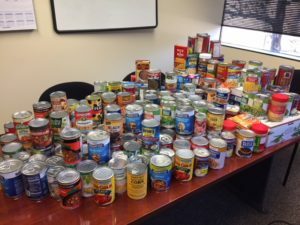 During the week-long event, each of Prime’s 50+ employees were divided into four teams that competed to see who could donate the most food items and money. For every dollar donated online, a team received three “meals,” or points. For ever food item donated, a team received five “meals,” or points. The competition provided a fun way to inspire and encourage employees to donate as much as they were willing! All food donations were dropped off at the Northfield Township Food Pantry in Glenview, IL, a local partner agency of the Greater Chicago Food Depository. 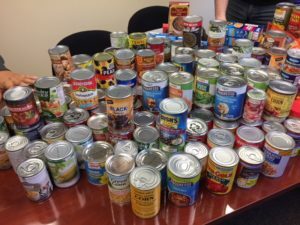 This year’s Thanksgiving Food Drive was a huge success! In total, Prime employees collected 304 food items and raised $1,000.97 – far surpassing our goal of collecting 150 food items and raising $800. Employees are already looking forward to the opportunity to serve members of our community during next year’s food drive with the Greater Chicago Food Depository.